Aly Dosdall: super stashbusters blog hop! Hello, and welcome! Thanks for stopping by our Super Stashbusters blog hop today! I'm thrilled to be a part of this blog hop along with some of my eight fabulous contributors. If you'd like to participate in our blog hop please browse around here and then hop over to the blog at the top of the link list below. A free seat in the class will be given away at some of the stops in the blog hop, so be sure to leave a comment on each blog and enter to win! If you'd like to learn more about my Super Stashbusters workshop which begins at the end of the month, you can visit the class description page HERE. Registration is now open! My crafty friend, Ashley Harris, designed a set of stamps for Avocado Arts last spring. She was kind enough to send me a set to play around with. I absolutely love her stamps--they're super useful and versatile. I created this layout using them. I filled my page background with diagonal washi tape strips and then stamped directly onto the washi tape using StazOn black permanent ink. I love the arrows, chevrons, and ledger lines in this set--right up my alley! This layout also happens to be one that I created based on a sketch and repetition challenge for my upcoming class, Super Stashbusters. Here's the sketch that the layout is based on. 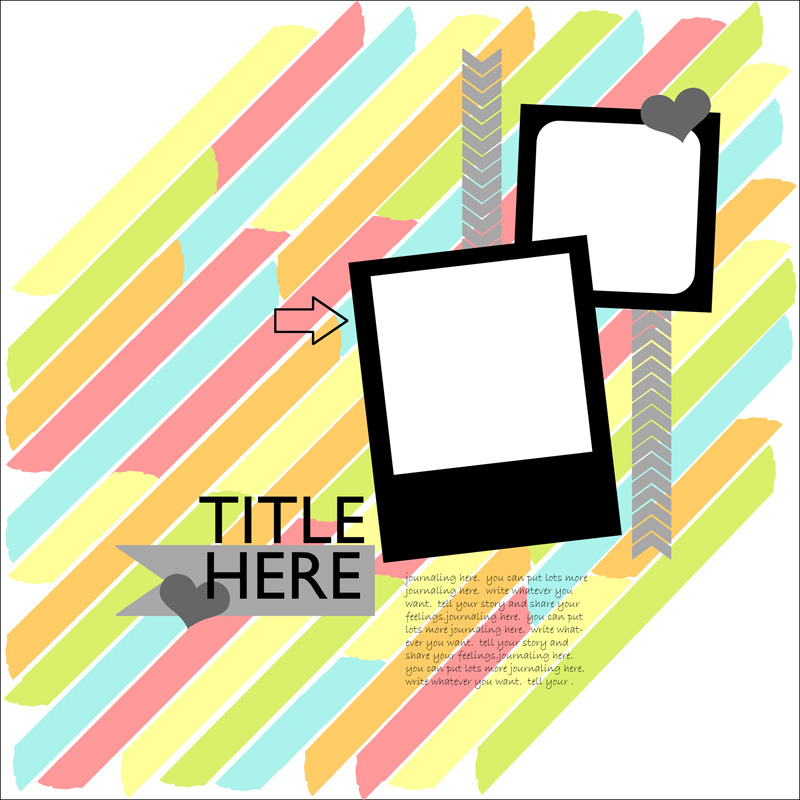 This challenge also comes with a video, studio cutting files, and a digital layered template for digital scrapbookers. Plus, you'll get to see a guest designer's take on the same challenge and sketch. What is your biggest scrapbooking nemesis? Creative Block, Captain Indecision, The Hoarder? Leave a comment on this post telling me what your biggest challenge is for a chance to win a FREE SEAT in Super Stashbusters! I'll announce the winner on Friday morning. Please check back to see if you won, and good luck! ETA: comments are now closed for this post. Thanks for entering! I don't know what my creative block is, but I am for sure SO inspired by your work, and I loved the first Stashbuster SO much, thanks for inspiring us! I am a hoarder and often can not find what I know I have. Hoarder, I have so much stuff. I think it slows me down starting a layout. I guess Captain Indecision keeps me from creating as much as I could. I have so many ideas but can't seem to get them done! I am a hoarder, afraid I will use so,etching up I will want for another layout later- but really with 4 kids time and energy are my biggest obstacles lol. I am really trying harder to schedule scrap time. I can't wait for your class! I'm a Hoarder...enough so that I could open a store. I buy stuff, I have friends who bring me stuff, I have friends of friends bringing me stuff! I'm constantly cleaning off my desk, and when I finish I have no time to scrap. Frustrating. I spend more time cataloging than creating. Captain Indecision keeps me from doing as much as I would like. I think way too much about how others will like the page and change my mind too many times. Thanks for a chance to win a seat! Mine is Creative Block and then Indecision. Looking at my room of supplies, you may think hoarder, but I actually have no problem any more pulling out something and using it. I just can't throw away the left overs! Mine would be Captain Perfection. I want it all to be perfect and spend way to much time trying to reach it. I am always purging supplies. Some are easy others have potential and even when I know i won't use it, I still am attached to the potential (ex: I don't do vintage very often. So why keep vintage style ribbon? But it's pretty and it has potential.) Thanks for the chance to win. Creative Block, Captain Indecision, The Hoarder. I have all these issues. I can surely use this class. My biggest roadblock is sorting and culling photos. Then I get to the indecision phase. I am a hoarder. I cannot find things when I need them. I really need to purge a lot. I for sure am stuck somewhere between Captain Indecision and Hoarder. I have the desire but I just don't ever seem to get those pages done. Looking forward to the class for some inspired help! I struggle with my photo organizing/printing system and indecision. I think too much about the perfect products, layout, photos and stories and get paralyzed. Love the main goal of stashbuster class!!!! I have a really hard time making decisions and getting going. I really want to scrapbook without scraplifting or using a sketch but I can't seem to do it! With no children at home and the grandchildren adults as well I have a hard time finding enough photos to take to scrapbook. Definitely a hoarder of scrap supplies. Just getting started and the longer I'm away from it the harder it gets! I have aspects of all of these disorders, but #1 is hoarding. Sounds like a great class, thanks for the chance to win a place. Am so a hoarder and am already signed up! My biggest block is the pile of stuff on my desk and the number of items on my to-do list that have to be finished before I scrap. Thanks for the chance to win! Definitely a Hoarder and therefore too much to go through to make up my mind which way to go. Get great results but takes way too much time.Granddaughter and I are working together this week scrapping and having loads of fun trying to thin the herd. She is 13 and awesomely ceative. Good inspiration, too. I guess I'm a hoarder and spend a lot of time looking through what I have. 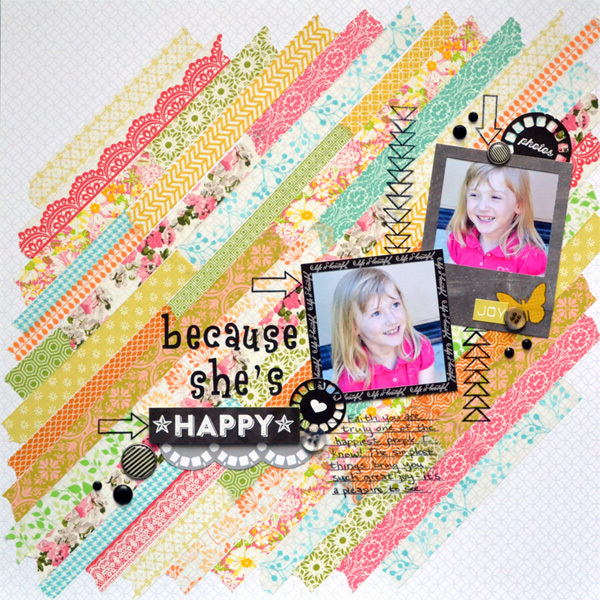 Love your page and how you used the washi tape. I would have to say it is too much to do and not enough time. I feel like whenever I try to scrapbook, I am constantly interrupted by children. This makes it more stress than it is worth. I think motivation is my biggest obstacle - that's why the first Stashbusting class was so great for me. It gave me a place to start and motivation to finish. I absolutely loved it and would love to win a spot in this year's class! My biggest problem is not being organized and having so much stuff, I can't remember where it is and/or I don't remember what I have. My biggest problem is that I am a "It's beautiful, new and I gotta-have-it" kind of girl. So I buy it and then I don't know what to use it for. Need to organize my embellishments better! I'm in the hoarder group. I have tons of paper and I am trying to use it. I was trying to calculate how many layouts it would take to make a dent in my supply but that's too scary. was I suppose to pick just one of these...Creative Block, Captain Indecision, The Hoarder. I'm pretty sure they all pertain to me. Lately, my hitch has been a combo of hoarder and lack of mojo. I am most definitely the paper HOARDER. I collect, collect, collect...just in case I might need it, but it's so pretty I don't want to use it! Oh dear....I am a hoarder. I've been sorting and purging and trying to create some space....and I keep finding stuff still in bags from the store! Hoarder--I love supplies and seem to collect them without using them! HELP. Choosing what to use together when it doesn't all come together in a kit. The title alone is what caught my attention for this class. I would love to use up my stash!!! Captain Indecision for sure. I have so much stuff but I never seem to have exactly what I want. My biggest block is design - I love how you provide sketches to start us on the design of the page! Indecision is the biggest cause for slow scrapping. Your challenges really help because they narrow the choices. Really hope to take this class! definitely creative block; sometimes things flow and other times, I just can't anything going. I'll put my hand up to be Miss Collector. I love buying & organising & looking at all my supplies but find it hard to use all the pretty stuff. Of those 3 nemeses, Hoarder fits me best. I'm better than I used to be because of the BP class about organization. But I haven't yet achieved the skills of moving new & old things in & out of my stash. Oh this is so terrible to admit but my biggest nemesis is getting things finished - I have ideas coming out the wazoo and half-finished layouts and projects all over the place. I get all inspired and start something and then get distracted by whats new and shiny and move on before I'm done. My biggest problem is always having to clean and organize before I start scrapping. I'm like the Swedish chef when I scrapbook and make a huge mess and usually end up with a 6x6 inch square of space!